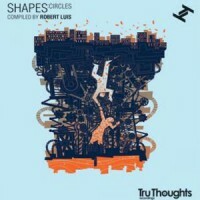 The latest in Tru Thoughts’ series of essential label compilations, compiled by A&R and label co-owner Robert Luis, 'Shapes: Circles' brings the best of the current sound of the label across 12 tracks and 2LPs, including a handful of remixes, upfront exclusives - a newbie from brand new signing Titeknots and an upfront album track from rising soul sensation Harleighblu - and cuts previously only available on other formats, as well as the odd stone cold classic. Serving to reinforce Tru Thoughts’ reputation as home to a diverse array of talent, the artists showcased here include Harleighblu, Belleruche, Ty, Wrongtom Meets Deemas J, Hint feat. T-Fly, Mark de Clive-Lowe feat. Omar & Sheila E, Titeknots, Yannah Valdevit & Lay-Far, The Bamboos feat. Aloe Blacc, Drumagick, Sleepin’ Giantz and Natalie Storm. Vinyl also comes with CD version of the album enclosed.